I needed a 220 volt to 110 volt power pigtail for a 220/110v dual voltage rated welder. This power pigtail allows you to use your welder's normally wired 220 volt plug and tap into a standard 110 volt wall plug. Your 220 volt welder will run at 1/2 power when powered by 110 volts. I bought a 20 amp, 12/3 (12 gauge 3 wire) 110 volt extension cord from Home Depot for my 110 volt pigtail. I cut off the female end and installed the female 250 volt 50 amp socket. I wired the green wire to the ground pin, black (hot) wire to the narrow blade, and white (neutral) wire to the wide blade. The extension cord cost $25 and the 250v female plug was $13 at Home Depot. A welder rated for 40 amps at 220 volts will need at least 12 gauge wire (20 amp 110v extension cord), a 30 amp welder can get by with a 14 gauge (14/3) 15 amp extension cord. The missing piece of the 110v pigtail puzzle is which power cord wire from the welder is connected to the 110v hot (black) wire. Your dual-voltage welder's manual should specify. 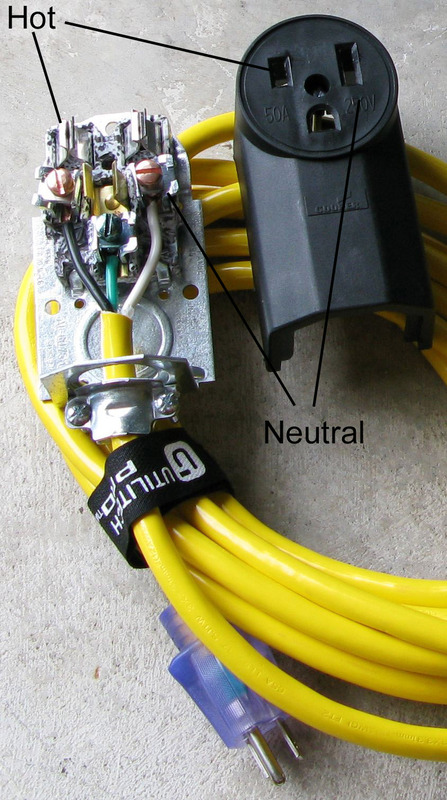 In one of the manuals I saw they specified the welder's yellow wire for 110v hot so you would make sure it was connected to the 220v power plug's narrow pin, the other hot wire to the wide pin, and the ground wire to the ground pin. You would then wire your 110v pigtail as described in the previous paragraph. If your 220 volt plug doesn't have narrow and wide pins, just make sure the plug is wired so the correct wire is hot when connected to your 110v pigtail. If your dual-voltage welder manual doesn't specify which of the two power cord wires should be hot for 110v you could just pick one and give it a try but it is possible you could damage the welder if you guess wrong. If you have a dual-voltage welder (I don't-yet) please chime in here and let us know what your manual says or what worked for your brand and model welder.